With today’s announcement of Microsoft’s planned purchase of LinkedIn, it appears that the business oriented social site will soon become a platform for connecting with Redmond’s proprietary products. Are you ready for MS LinkedIn? Too bad. It’s coming. Today Microsoft announced in a press release that it’s purchasing the social network for $196 per share in an all-cash deal worth $26.2 billion. Although the sale will require shareholder approval, that’s evidently not going to be a problem. According to a PDF presentation posted by Microsoft, LinkedIn’s board has unanimously recommended the deal and the social site’s board chairman, co-founder and controlling shareholder, Reid Hoffman, is supporting the transaction and intends to vote his shares “in accordance with the Board’s recommendation.” The deal is expected to be completed by year’s end. The press release further states that Jeff Weiner will be staying on as LinkedIn’s CEO, reporting directly to Satya Nadella, and includes a video (included below) of Weiner and Nadella being interviewed on the ownership change. The social site “will retain its distinct brand, culture and independence,” but that only appears to be true to a degree. 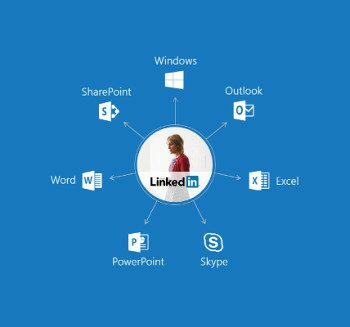 One graphic in the PDF presentation shows LinkedIn as a central hub surrounded by Microsoft proprietary products, including all of the components of MS Office, Windows and Skype. Indeed, Redmond seems to have grand plans for its new property, most of them revolving around using the platform as a sales tool for its proprietary products and services. It’s touting an “Intelligent News Feed” that will evidently be tailored to the user’s LinkedIn network, incorporating Cortana which will “know your entire professional network to connect dots on your behalf” (how will that work for GNU/Linux users, I wonder) and a host of other plans that include the ability to integrate Microsoft’s Dynamics CRM (“and other CRM systems”) to the LinkedIn Sales Navigator, as well as tight integration with Office. All of these planned new features seem useful enough, but will require users to connect with Microsoft’s proprietary stack. Cortina integration, for example, will most likely require the use of Windows (with some effort probably being made for Mac users), and nowhere is there any indication that LibreOffice or OpenOffice will be able to take advantage of any of the features earmarked for being incorporated into Office 365. Corporate America, which is already locked-in to Microsoft’s products, will probably embrace the New Microsoft’s vision for LinkedIn and we can expect that business users will begin increasing the scope of their reliance on the social platform — at least it appears that is what Redmond is hoping. The vast majority of consumers will also probably find many of the new features useful. For many of us, that might be easier said than done. Just as we can’t leave Facebook because our personal friends won’t follow us to an alternative, our business contacts aren’t likely to follow us to a new networking site just because we have problems with Microsoft. Okay, well, it was bad enough when LinkedIn took over Linda.com — now it’s even worse; M$ is taking over LinkedIn. You will either be owned by Facebook, Google, Microsoft or Apple [or if you are even sillier, Yahoo] — choose your poison; or fight back to keep control of your life and your data. Or Cloudfare! I sure as heck wish that fossforce website was NOT behind CF. Skype too…… the US Government and all their eyes abroad, including Australia, New Zealand, Canada and the GCHQ. Internet of broken things (poor or little security).No thanks. The Internet is very fast becoming a no-go zone. The OPEN web and OPEN systems is the only way to go. All self hosted, don’t trust the big guys; they’ll get you by the balls and then squeeze you for more cash per user and before you know it, there won’t be money left for profit in your business. I’ve avoided LinkedIn for a long time, I do have a placeholder there, but I am not buying in to it, ever. TL;DR; — they want to own all the data. It’s a complete ball of wax and that’s before they send reports on to government bodies. Definitely a big no thanks from me. @Andrew… I agree. LinkedIn is going to get even uglier. It’s probably to true to no degree at all. This is a standard lie that management tells people during a takeover/buyout/whatever. This keeps everyone in place and on task so minimal disruption will occur during the “transition.” My recommendation to all LinkedIn emnployees… update your resume now and move on. Yes, to have been a Nokia employee [if you ever were] would probably mean… “you were screwed over by M$”. There were plenty of good reasons not to use LinkedIn before. Just icing on the cake. And I most definitely don’t mean M$ or LinkedIn for the destination. The good news is the Linkedin account I thought I had is either no longer active and or it was created under an email address I no longer use. I’ve always been under the impression that “deleting” an account never really did what it said on the tin. I really doubt facebook, linkedin & co. forget about you all of a sudden. Part of me hopes this will encourage more people to contribute to e.g. diaspora and FreedomBox, in order to offer decentralized alternatives. The problem I have with Diaspora is that it’s basically a copy of Facebook. It has all the things I dislike about Facebook (and Google+ for that matter)… everything everyone you are linked to turns up on your homepage, and it just turns into a mess of everyone else’s noise. This still requires a hosting provider, but yes, at least it is one step removed from actually handing over your data to those who would like to collect and categorize it, in their preferred format. Ultimately, something like freedombox, as @PsynoKhi0 said. What part of “self hosting” don’t you understand? I take care of everything other than that which can only be done by a registrar; my own DNS, my own mail, my own website, currently ownCloud (soon Nextcloud instead) …. everything is self-hosted.